The 11th Overset Composite Grids and Solution Technology Symposium will be held 15-18 October 2012 in Dayton, Ohio. Abstracts for both presentations and student posters are now being accepted with a deadline of 29 June. Topics being sought are unsteady and moving body problems, emerging hybrid strategies, works in progress as well as those recently completed. The Symposium consists of three days of technical presentations preceded by one day of tutorials and workshops. Particles colored by velocity and sized by age. Simulation by PowerFLOW, postprocessed in PowerVIZ. Image from Exa. 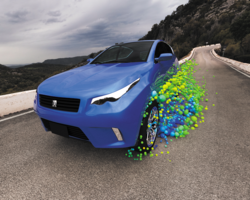 Altair Hyperworks is now available for Mac OS X.
NAFEMS’ The CAE Guy will be hosting a webinar pitting CFD experts vs. designers. The University of Pittsburgh’s Swanson School of Engineering has been awarded a $1.3M grant from the U.S. Dept. of Energy which will go, in part, to CFD simulations of high temperature gas reactors. WindSim version 5.1 was released for CFD simulation of wind turbines. When I found another article with “mesh” and “software” in its title the result turned out to be completely unexpected. 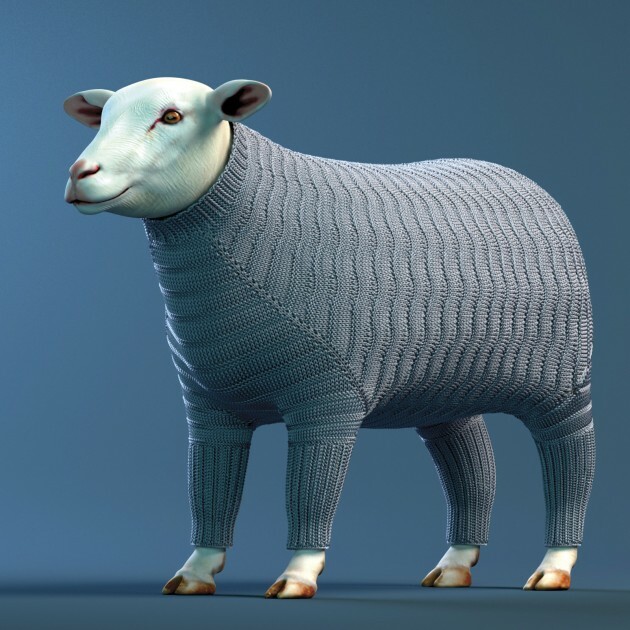 Stitch Meshes is software for simulating knitted garments. The software starts with a simple faceted model of the garment onto which one generates a mesh. Each cell of the mesh is assigned a particular type of stitch and a pattern tool is available for creating arrays of common stitch patterns. A relaxation technique is then applied to achieve a realistic model of the garment. Be sure to watch the video. This article hits a little close to home because Pointwise shares a building with a retail yarn shop. Who knew we had so much in common? This entry was posted in Applications, Events, News, Software and tagged Altair, Exa, HyperWorks, Khamsin, overset, PowerFLOW, WindSim. Bookmark the permalink.